The most amazing feature of Tower Cottage in Warkworth is the dramatic view it has of Warkworth Castle from the lounge and bedroom windows. 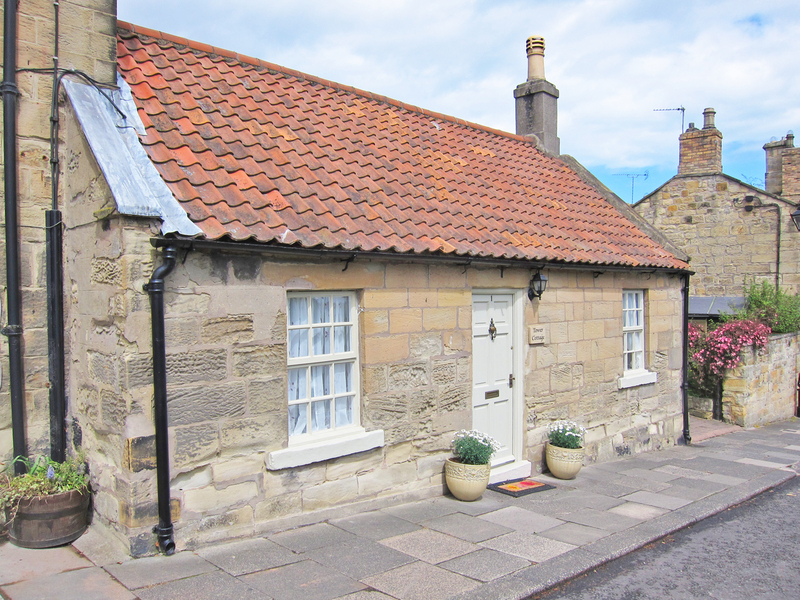 A historic, centuries-old stone cottage, it’s situated in the heart of the beautiful medieval village of Warkworth. With its picture postcard beauty, interesting range of pubs, restaurants, quirky little shops, a renowned art gallery and even a French Patisserie within a minute’s walk, you can even walk to one of the best beaches in the UK from here! 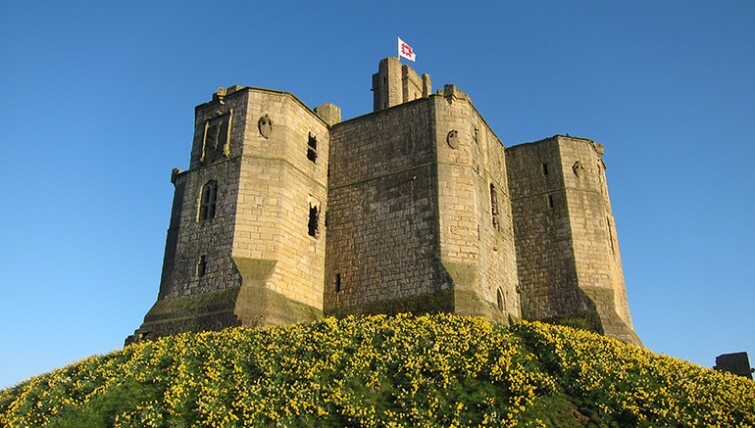 Warkworth Castle is situated just across the road from Tower Cottage. There’s an entrance to the grounds just to the right which takes you into the grounds of the castle and down to the beautiful riverside. Tower Cottage in Warkworth is all on one level, with no steps other than a step into the cottage from outside. There is one bedroom, a bathroom, lounge/dining room and separate kitchen. Whilst there is no garden, there is a pretty bench seat for sitting out at the front of the cottage which is south facing (not shown in the image below), although as well as facing the fabulous castle, it is also facing the road. However the grounds of the castle are immediately opposite, where you can sit in peace and quiet and admire the view of the castle, the River Coquet and the beautiful countryside beyond. Tower Cottage has been awarded 4 Stars by Visit Britain, in addition to a prestigious GOLD Award for excellence. 1 dog is very welcome for a small charge of £20 per holiday (2 very small dogs by arrangement only). This is the view from Tower Cottage, taken from the front of the cottage. Warkworth Castle is situated just across the road from the cottage. There is an entrance to the grounds just to the right side (out of view in the image below) which takes you into the grounds of the castle and down to the beautiful riverside. Entering through the front door, an inner hallway leads into the spacious lounge which is very cosy. With an open fire providing a wonderful ambience on cooler evenings (full central heating is provided, so the fire is not necessary as a main source of heat), this room epitomises what a cosy country cottage should be. With a view to the front of magnificent Warkworth Castle, you really do feel a sense of the history and provenance of the cottage. There’s a very comfortable sofa, separate armchair and a dining table and chairs in this spacious yet cosy room. Flat screen TV and free Wi-Fi. There’s a telephone for receiving incoming calls (outgoing calls to emergency numbers only). Mobile reception in the cottage is generally good. 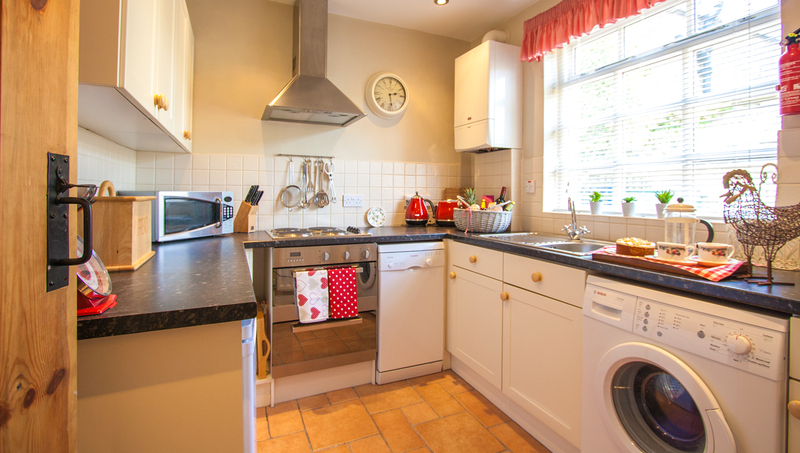 The kitchen is well equipped with all the appliances you would expect, including electric oven and hob, dishwasher, fridge with freezer box, microwave, toaster, kettle and washing machine. The window overlooks a small courtyard to the rear belonging to the neighbouring house. Although guests have access over this courtyard to use the rear entrance to the cottage, they are not permitted to use the courtyard for anything other than access to and from the cottage. A rear hallway leads to the lounge and bathroom, and the rear doorway. A beautifully decorated and furnished room with a very comfortable double bed (4ft 6″ wide), beautiful quality bed linen and towels, luxury mattress and plenty of storage space. The pretty cottage window to the front of the cottage looks out over the road to Warkworth Castle. Tower Cottage in Warkworth is situated in the prettiest village of Northumberland, with lovely riverside walks, beach walks, interesting little shops, art galleries, French Patisserie, ancient Church and a magnificent Castle and Hermitage to explore. Tower Cottage is the perfect Northumbrian village cottage, built in the Georgian period with a breathtaking view of Warkworth Castle. 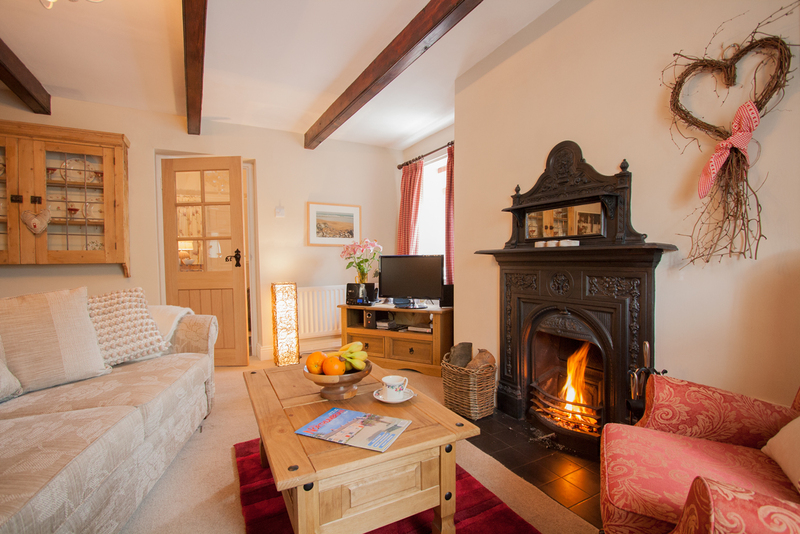 The lovely open fire provides a wonderful ambience, and with all the amenities of this lovely village just yards away, this cosy and luxurious cottage is the perfect holiday bolt-hole. The compact kitchen is well designed with everything you should need. The dining area is in the lounge. The calm and relaxing bedroom has plenty of storage and a comfortable double bed. The recently upgraded bathroom has a large window letting in lots of natural light, a bath with a shower over, WC and basin. The view of Warkworth castle from the cottage - we can't think of anything better to wake up to! Following the loop of the River Coquet as it encircles Warkworth village. Seals can often be seen in the river at high tide as they seek out the salmon to play with! Amazing creations - how could you resist? Northumbrian Welcome Hamper including luxury White Company Toiletries and bespoke Property and Local Area guide. Open fire and free Wi Fi. 1 dog welcome (2 small dogs by arrangement only). Booking Conditions apply, see more details on our Dogs page. Dogs are not permitted on furniture and strictly not to be left in the house unattended. Dog sitting service available, contact us to request. No outside space as such, but there is a bench seat at the front of the cottage to enjoy the magnificent view of the castle, or you can cross the road in front over to the castle where there are seats with a perfect view of the castle and countryside. Parking is outside the cottage on the roadside but is not a dedicated bay so cannot be guaranteed all of the time. There is further free parking within around 50 or so yards. An initial supply of wood is provided for the fire between October and April. Further supplies can be purchased from the hardware stores or fuel garages in Amble (1 mile south). 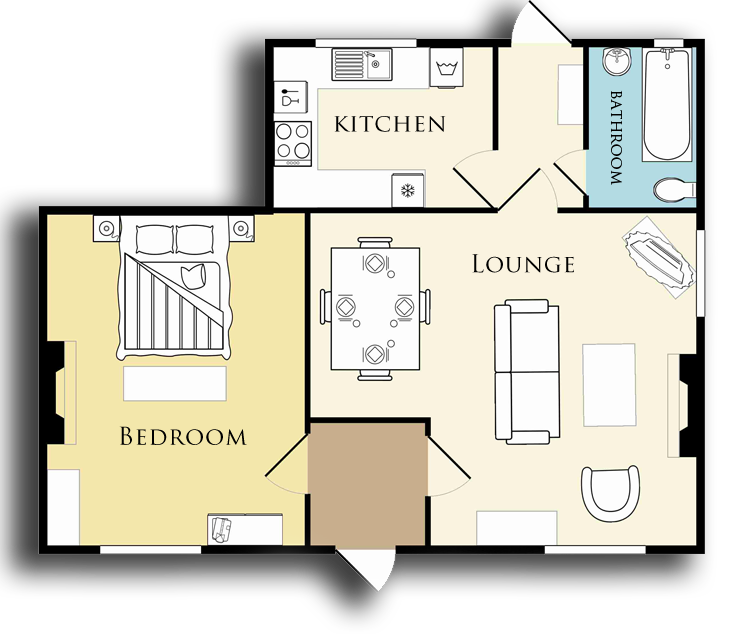 One double bedroom with a double size bed (4ft 6″ wide). Hairdryer. A feather duvet is provided on the bed. There are two synthetic pillows and two feathered pillows provided. A synthetic duvet and full set of synthetic pillows can be provided upon request, please inform us at the time of booking or a minimum of 7 days before your holiday. One bathroom with a shower over bath, WC and basin with heated towel rail. Towels and complimentary toiletries by The White Company provided. Fridge with freezer box, electric oven, dishwasher, microwave, toaster and kettle. Washer/dryer, iron, ironing board and vacuum. Hairdryer, books, music and films. Open fire. Flat screen TV in the lounge with Freeview and DVD player. Radio and music system. Free unlimited Wi-Fi. Accommodation all on one floor. Level access throughout apart from one small step up to the back door. Click on the arrow to view our virtual tour – use your mouse or touch screen to move around the cottage. Our floor plan is not perfectly to scale, but provided to give you a general guide to the layout. Click on the floor plan to enlarge it. Tower Cottage is located right at the foot of the magnificent Warkworth Castle, with fab views from the lounge and bedroom windows. To the left, you’ll find The Sun Inn pub and steakhouse which then leads down to the pretty Coquet river bank. To your right, you can walk straight down the main street to Warkworth’s shops, other 3 pubs, restaurants and cafes’, as well as the pretty church of St. Lawrence. Head over the 14th C. fortified bridge to get to the beach. The lovely walk to Amble alongside the Coquet Estuary which leads out to sea is wonderful and highly recommended. Lunch in one of the many little seafood restaurants is well deserved, walking it off on the return! It will take about 20 minutes to reach Amble Harbour from Tower Cottage and is a very pleasant walk. You can also walk to Alnmouth in the other direction heading north by taking the cycle route to Alnmouth along the back of dunes. It’s a great walk and you’ll certainly be ready for a pint at one of the country pubs by the time you get there. It’s about 4 miles one way and takes just over an hour. If you’re shattered, get the bus back (they allow dogs to ride for free too!). To find out the distance of Tower Cottage from your own home, how long it will take to drive there and other options for alternative transport, click here: Tower Cottage on Googlemaps and enter your home postcode. The postcode of the cottage is NE65 0UW. Lovely welcome pack for us and our dog which was really thoughtful. 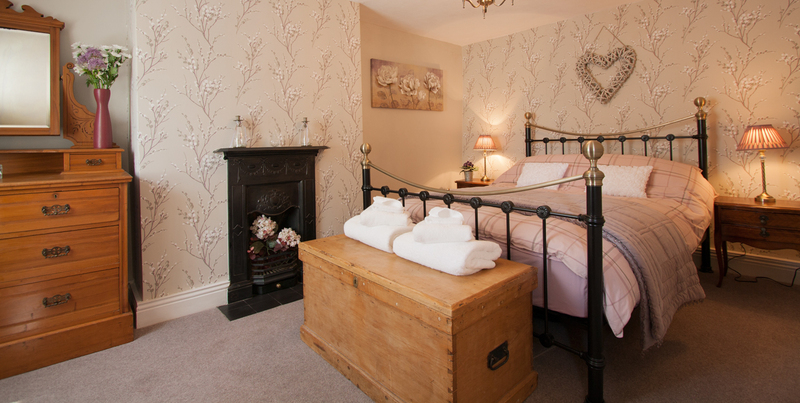 The cottage was very clean and well decorated giving it a cosy feel – just what we wanted. The real fire and the location were great. Had a great weekend in Warkworth, I would definitely book with Coquet Cottages again. Fancy a special walk around the village? Try the Mill Walk which you reach through the castle grounds (over the road from the cottage). Whether you have a dog or not, this is a very pretty route that only takes about 30-35 minutes. Follow the river and it takes you along a beautiful walk along the Coquet River, eventually ending up at the clearing where The Hermitage is located (see more on our page all about Warkworth). Deer can be spotted here as well as lots of other wildlife along the riverbank. Forget the frying pan and nip along to Bertram’s for a hearty breakfast in front of the roaring fire! From the traditional full English and local favourite Craster Kippers, to something a little lighter such as homemade porridge with fresh cream and berries or fresh fruit with granola and yoghurt, coupled with a hot mug of fresh coffee, you can reward yourself after a long walk on the beach and set yourself up for the rest of the day. The best bit? It’s dog friendly! Have a trip to Alnwick Castle and Garden, and enjoy a spot of lunch at The Treehouse. Although not cheap to get into the attractions, the tickets do allow entry for a year so it’s an excuse to visit Northumberland again! Make sure you book up in advance at The Treehouse as it’s very popular. “Although I live in Dorset, another very beautiful county, my heart lies in Northumberland and I regularly make the 450 mile journey up here to my pretty little sandstone cottage in Warkworth. It faces Warkworth Castle, so is situated in a very special place, having been built in the 1700’s and is a listed building. It has a sense of history and permanence that is comforting and reassuring. I always take a peek outside the front door in the evening, and with the moon shining behind the castle and stars twinkling in the dark sky it feels quite magical!